Ludwig Josef Johann Wittgenstein (1889 - 1951) was an Austrian philosopher and logician, and has come to be considered one of the 20th Century's most important philosophers, if not the most important. Both his early and later work (which are entirely different and incompatible, even though both focus mainly on the valid and invalid uses of language) have been major influences in the development of Analytic Philosophy and Philosophy of Language. The Logical Positivists of the Vienna Circle in particular were greatly influenced by his "Tractatus Logico-Philosophicus" (although Wittgenstein alleged that they had fundamentally misunderstood much of it). The ideas in his later "Philosophical Investigations" ushered in the era of Ordinary Language Philosophy and brought language to the forefront of modern philosophy. His significance has been primarily in the areas of Logic, Metaphysics, Epistemology, the Philosophy of Mind, the Philosophy of Language and the Philosophy of Mathematics. However, his influence has extended beyond what is normally considered philosophy, and may be found in various areas of the social sciences (including social therapy, psychology, psychotherapy and anthropology) and the arts. Wittgenstein (pronounced VIT-gun-shtine) was born on 26 April 1889 in Vienna, Austria, into one of the most prominent and wealthy families in the Austro-Hungarian Empire. His father was Karl Wittgenstein, an industrialist from a Protestant family converted from Judaism, who went on to make a fortune in iron and steel; his mother was Leopoldine Kalmus, from a mixed Jewish-Catholic family. He was the youngest of eight children, all of whom were baptized as Roman Catholic despite the religious views of their parents' families. His father was a leading patron of the arts, especially music, and the Wittgenstein house often hosted important musicians such as Johannes Brahms and Gustav Mahler. Both his parents were very musical, and all their children were artistically and intellectually educated. Ludwig's older brother, Paul Wittgenstein, went on to become a world-famous concert pianist (even after losing his right arm in World War I), and Ludwig himself had perfect pitch and played the clarinet throughout his life. His family members were also intensely self-critical to the point of depression and suicidal tendencies (three of his four brothers committed suicide). Wittgenstein was educated at home until 1903, after which he began three years of schooling at the Realschule in Linz (Adolf Hitler was also a student there at the same time, although it is not known whether the two knew each other). Wittgenstein apparently spoke an unusually pure high German, albeit with a slight stutter, and insisted on using the formal form of address even with his classmates. He wore very elegant clothes, and was highly sensitive and extremely unsociable. In 1906, he began studying mechanical engineering in Berlin, and in 1908 he went to Victoria University, Manchester to study for his post-graduate degree in engineering and aeronautics. It was during his research in Manchester that he became interested in the foundations of mathematics, particularly after reading the "Principia Mathematica" of Alfred North Whitehead and Bertrand Russell and the "Grundgesetze der Arithmetik" of Gottlob Frege. In 1911, he visited and corresponded with Frege, who advised him to study under Russell in Cambridge. Later in 1911, Wittgenstein arrived unannounced at Russell's rooms in Trinity College, Cambridge and was soon attending his lectures and discussing mathematics and philosophy with him at great length. He made a great impression on both Russell and G. E. Moore and, as he started to work on the foundations of Logic and mathematical Logic, Russell began to see Wittgenstein as a possible successor who would carry on his work. During his time at Cambridge, Wittgenstein's other major interests were music, the cinema and traveling, often in the company of his great friend, David Pinsent. He was invited to join the Cambridge Apostles (the elite Cambridge secret society to which Russell and Moore had both belonged as students). In 1913, he inherited a large fortune when his father died, donating some of it, initially anonymously, to Austrian artists and writers. Although he was invigorated by his study at Cambridge, Wittgenstein came to feel that he could not get to the heart of his most fundamental questions while surrounded by other academics, and in 1913 he retreated to the relative solitude of the remote village of Skjolden, Norway. This isolation allowed him to devote himself entirely to his work, and he later saw this period as one of the most passionate and productive times of his life. He wrote an unpublished book entitled "Logik", a ground-breaking work in the foundations of Logic, which was the immediate predecessor and source of much of the later "Logisch-Philosophische Abhandlung" ("Tractatus Logico-Philosophicus"). The outbreak of World War I in 1914 took him rather by surprise (living in seclusion as he was), but he volunteered for the Austro-Hungarian army, serving on the Russian front and in northern Italy. He won several medals for bravery and, towards the end of 1918, he was captured and held as a prisoner of war by the Italian army at Cassino in central Italy. It was in this Italian prison that he completed his magnum opus, the "Tractatus Logico-Philosophicus". When he heard the news that his friend, David Pinsent, had been killed in action, Wittgenstein became inconsolable and almost suicidal. However, with the help of his Cambridge friends, Bertrand Russell and John Maynard Keynes (1883 - 1946), Wittgenstein managed to get access to books and to prepare the manuscript of the "Tractatus", and send it back to England for translation and publication. Russell had recognized it as a work of supreme philosophical importance and wrote an introduction for it (lending the book his reputation as one of the foremost philosophers in the world), but Wittgenstein argued with Russell over it, and eventually it was not published until 1821 in German and 1922 in translation. After the War, Wittgenstein was a profoundly changed man. Although a militant atheist during his stint at Cambridge, he became something of a born-again evangelist of sorts after reading "The Gospel in Brief" by Leo Tolstoy (1828 - 1910), which he happened to pick up during the War. In 1919, he gave away his portion of the inherited family fortune to his sisters Helene and Hermine and his brother Paul (he felt that giving money to the poor could only corrupt them further, whereas the rich would not be harmed by it) and began to follow a new ascetic life. Convinced that his "Tractatus" had solved all the problems of philosophy and that he had precipitated the end of philosophy, he left philosophy entirely and returned to Austria to train as a primary school teacher. He had somewhat unrealistic expectations of the rural children he taught, and little patience with those who had no aptitude for mathematics. His severe disciplinary methods (often involving corporal punishment, not unusual at the time) and intense and exacting teaching methods eventually culminated in 1926 in the collapse of an eleven year old boy whom Wittgenstein had struck on the head. Although he was cleared of misconduct, he resigned his position and returned to Vienna, feeling that he had failed as a school teacher. He worked for a time as a gardener's assistant in a monastery near Vienna, but was advised that he would not find what he sought in monastic life. His spirits were restored to some extent by his work on the architectural designs of a modernist house for his sister Margaret. Towards the end of that project, he was contacted by Moritz Schlick (1882 - 1936), a leading figure in the newly-formed Vienna Circle and the Logical Positivism movement, who was tremendously interested in Wittgenstein's "Tractatus". Although he found the meetings he attended extremely frustrating, (believing that Schlick and his colleagues had fundamentally misunderstood his work), the intellectual stimulus did have the effect of drawing him back into philosophy, and over the course of his conversations with the Vienna Circle, and especially with the young Frank P. Ramsey (1903 - 1930), Wittgenstein began to think that there might be some "grave mistakes" in his work. In 1929, urged by Ramsey and others, he decided to return to Cambridge (using the "Tractatus" as his doctoral thesis), and was rather disconcerted to find that he was now considered a philosophical genius and one of the most famed philosophers in the world. He was duly appointed as a lecturer and was made a Fellow of Trinity College. In 1931, he broke off his engagement with Marguerite Respinger (a young Swiss woman he had met as a friend of the family), and most of his romantic attachments were to young men. In 1934, he conceived the idea of emigrating to the Soviet Union with his long-time friend Francis Skinner (1912 - 1941). Although they were offered teaching positions there in 1935, they preferred to take up manual work, but returned disillusioned after only three weeks. From 1936 to 1937, Wittgenstein lived again in Norway, where he worked on his on-going "Philosophische Untersuchungen" ("Philosophical Investigations"), in which he developed a completely new philosophy, quite different from his earlier work, even though nothing was actually published until after his death in 1951. In 1938, he traveled to Ireland to visit his friend Maurice Drury who was training as a doctor, and also at the invitation of the Irish Prime Minister Eamon de Valera, who was himself an amateur mathematician. While he was in Ireland, however, Germany annexed Austria in the Anschluss, and Wittgenstein became technically a citizen of the enlarged Germany and a Jew under its racial laws. The family tried to have themselves reclassified as Aryan/Jewish crossbreeds, using their considerable fortune as a bargaining tool, which they eventually achieved in 1939. By that time, however, Wittgenstein had been appointed to the chair in Philosophy at Cambridge (after G. E. Moore's resignation in 1939), and had acquired British citizenship soon afterward. During World War II, he left Cambridge and volunteered as a hospital porter in Guy's Hospital in London, and as a laboratory assistant in the Royal Victoria Infirmary in Newcastle (arranged by his friend John Ryle, brother of the philosopher Gilbert Ryle). After the War, he returned to teach at Cambridge, although he had never really liked the intellectual atmosphere there (he often encouraged his students to find work outside of academic philosophy, and found teaching an increasing burden). 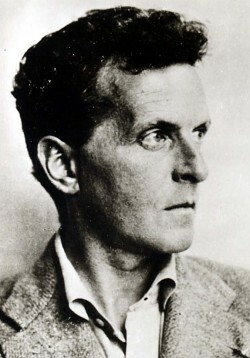 Wittgenstein resigned his position at Cambridge in 1947 to concentrate on his writing, spending two years living at a guesthouse in East Wicklow, Ireland, and then in the rural isolation of the west coast of Ireland. In 1949, he was diagnosed as having prostate cancer, by which time he had written most of the material that would be published after his death as "Philosophische Untersuchungen" ("Philosophical Investigations"), arguably his most important work (the "Tractatus Logico-Philosophicus" notwithstanding) and perhaps the most influential of all post-War works of philosophy. He spent the last two years of his life working in Vienna, the United States, Oxford and Cambridge and, up until two days before his death, he was working on new material in collaboration with his former student Norman Malcolm (1911 - 1990), which was published posthumously as "On Certainty". Wittgenstein died from prostate cancer at the home of his Cambridge doctor, Edward Vaughan Bevan, on 29 April 1951. His last words were: "Tell them I've had a wonderful life". Some thirty thousand pages of incomplete manuscripts were found after his death. Perhaps more than any other major philosopher, Wittgenstein's work falls into two very distinct periods: an early period, culminating in the publication of his ground-breaking "Logisch-Philosophische Abhandlung" ("Tractatus Logico-Philosophicus") in 1921; and a later period of largely unrelated (and indeed incompatible) work, which was written over many years but not published until two years after his death as "Philosophische Untersuchungen" ("Philosophical Investigations"). His early work on the foundations of Logic and his philosophy in general were deeply influenced by Arthur Schopenhauer and Immanuel Kant, as well as by the new systems of Logic put forward by Bertrand Russell and Gottlob Frege. When his work began to take on an ethical and religious significance during World War I, his "Tractatus Logico-Philosophicus" gradually took shape, although it was still very much in line with the general Logicist approach of the time as exemplified by Russell and Whitehead's "Principia Mathematica". Due to various personal difficulties and arguments, the "Tractatus" was not published until 1921, and it remained the only philosophical book Wittgenstein published during his lifetime. For a time, he believed that the work offered a definitive solution to all the problems of philosophy. The "Tractatus" attempted to define the limits of Logic in understanding the world. It claimed that the world consists of independent atomic facts (existing states of affairs) out of which larger facts are built, an idea that later became known as Logical Atomism and was further developed by Bertrand Russell. Language too consists of atomic (and then larger-scale) propositions that correspond to the facts of the world by sharing the same "logical form". The key to understanding the "Tractatus" is Wittgenstein's picture theory of meaning. He drew an analogy between the way that pictures represent the world and the way that language (and sentences it is made up of) represent reality and states of affairs, and he asserted that thoughts, as expressed in language, "picture" the facts of the world. Furthermore, the structure of language is determined by the structure of reality, and we are able to talk about reality not just because we have words that stand for things, but because the words within a sentence have a relationship to each other that corresponds to the relationship things have to each other in the world. Indeed, Wittgenstein claimed that, unless language mirrored reality in this way, it would be impossible for sentences to have any meaning. It should be stressed here that Wittgenstein was not referring to ordinary everyday conversational language, but to the "elementary sentences" which underlie ordinary language, and which can be distilled out of everyday language by analysis. He made clear that the so-called logical constants ("not", "and", "or" and "if") were not part of the picturing relationship, but were merely ways of stringing multiple pictures together or operating on them. Thus, Wittgenstein claimed that we can analyze our thoughts and sentences to "express" (in the sense of "show", not "say") their true logical form, but those we cannot so analyze cannot be meaningfully discussed, and so should not even be spoken of. He believed that the whole of philosophy essentially consists of no more than this form of analysis, and that non-factual concepts such as those in the fields of Ethics, Religion and Aesthetics were effectively unsayable and meaningless. Some commentators have pointed out that the sentences of the "Tractatus" would not qualify as meaningful according to its own rigid criteria, and that Wittgenstein's method in the book does not follow its own demands regarding the only strictly correct philosophical method. Some have gone so far as to argue that the book is actually deeply ironic in that it demonstrates the ultimate nonsensicality of any sentence attempting to say something metaphysical. Either way, having originally propounded this stance in the "Tractatus", Wittgenstein was to reject it in his later "Philosophical Investigations". The logical positivists of the Vienna Circle, it should be noted, immediately seized on Proposition 7 of the book, "what we cannot speak of, we must pass over in silence", even though Wittgenstein himself gave it a rather different, and much more mystical, interpretation. By the time of World War II, Wittgenstein's views on the foundations of Logic and of mathematics had changed considerably, and he now denied that there were any mathematical facts to be discovered, and denied that mathematical statements could be "true" in any real sense. He argued that mathematical statements simply expressed the conventional established meanings of certain symbols. He further denied that a contradiction should count as a fatal flaw of a mathematical system. His series of lectures on this and other topics were later documented in the book, "Wittgenstein's Lectures on the Foundations of Mathematics". He renounced or revised much of his earlier work, and developed a completely new philosophical method and a new understanding of language, culminating in his second magnum opus, the "Philosophische Untersuchungen" ("Philosophical Investigations"). His earlier search for a perfect language had ended in stalemate, and his claim that "the limits of my language mean the limits of my world" began to appear too restrictive. He started working on a new line of thinking during his time in Norway in 1936, and continued throughout his stay in rural Ireland towards the end of life. The book was published posthumously in 1953, although in reality it is not a systematic treatise like his "Tractatus" but rather a series of more or less independent thoughts and lectures. Although brilliantly aphoristic in style, it is nevertheless difficult reading, appearing at times almost as a more or less random jumble of thoughts, and individual paragraphs may have little or no connection to those preceding or succeeding. It too, however, came to be regarded as just as influential as the "Tractatus", and its very different focus from his earlier work (largely on language and psychology rather than on logic and objective truth) is usually referred to as "the late Wittgenstein". In the "Philosophical Investigations", Wittgenstein moved away from the picture analogy and towards a "tool" or "use" analogy. He claimed that words should be thought of as tools and that, in most cases at least, the meaning of a word is just its use in the language. Thus, completely contrary to the picture theory of meaning, the structure of language determines what we think of as reality. Also, although a picture can only give one representation of reality, a tool can have many different uses (and so, therefore, can words, particularly when used in different circumstances or in different types of conversation). He likened the various different meanings a word could have to family resemblances, which can have common features, criss-crossing similarities or overlapping relationships but nevertheless remain distinct and unique. Although apparently banal and common-sensical, this idea was quite a radical one as it militated against several long-held assumptions in philosophy: that words get their meanings by standing for objects, that words get their meaning by being associated with ideas in the mind, and that words represent some underlying trait or essence. He also introduced another analogy, that of language as a kind of game, an activity governed by pre-set rules over which we have no control, but which allow a certain limited amount of latitude and interpretation. He suggested that language (and its uses) was essentially a multiplicity of "language-games" within which the parts of language function and have meaning. Many conventional philosophical problems (e.g. "What is truth?") therefore become simply meaningless wordplay or "bewitchments" arising from philosophers' misuse of language. Although language works relatively well as part of the fabric of life, once it is "forced" into a metaphysical environment (where all the familiar and necessary landmarks and contextual clues are absent), then problems arise. Wittgenstein saw the role of philosophy as merely to describe (not to justify or provide a foundation for) these language-games. He pointed out that philosophical problems can be solved using logically perfect language, without the confusing and muddying effects of everyday contexts, but cautioned that such language is sterile and can do no actual useful work. Neither was it possible to step back and appraise a language-game from a non-linguistic point of view, as we are always operating within a language-game. Much of the "Philosophical Investigations" consists of examples of how philosophical confusion is generated and how, by a close examination of the actual workings of everyday language, the first false steps towards philosophical puzzlement can be avoided. He urged philosophers to “bring words back from their metaphysical to their everyday use", ushering in the era of Ordinary Language Philosophy. Along with later philosophers such as W. V. O. Quine and Donald Davidson in the 1950's and 1960's, Wittgenstein broadened the principle of semantic Holism even further to arrive at the position that a sentence (and therefore a word) has meaning only in the context of a whole language (not just a larger segment of language). Much controversy has been generated by the implications of Wittgenstein's language-games theory for the possible existence of a "private language" (a language invented by an individual to describe his own feelings and sensations in terms that no-one else could understand). The controversy arises because many philosophers have assumed that this must be the basic fundamental use of language, because our knowledge of, and interactions with, the outside world must start with our inner experiences. Wittgenstein, however, believed that this is not how language works, and that we use words in conjunction with public criteria, behaviors and situations, so that we can never in fact speak a private, or entirely personal, language. He points out that the rules which govern any language must have a social aspect and that the meanings of words depend on the social context within which they are used (what he called "forms of life"). Although the early Wittgenstein had completely dismissed out of hand all talk of religion as meaningless nonsense, the later Wittgenstein was concerned to "get inside" the religious language-game, to look at how words were used in a religious context and to show that the religious language-game was completely different from the scientific language-game. He formulated his own version of Fideism which argued that religion is a self-contained, and primarily expressive, enterprise, governed by its own internal logic or “grammar”. He pointed out that religion is logically cut off from other aspects of life; that religious discourse is essentially self-referential and does not allow us to talk about reality; that religious beliefs can be understood only by religious believers; and that religion therefore cannot be criticized. Wittgenstein has in recent years, become influential in areas quite outside of philosophy, including literary criticism, the arts and aesthetics in general, the social sciences (particularly anthropology), political theory, etc. See the additional sources and recommended reading list below, or check the philosophy books page for a full list. On Certainty / ÜBER (UBER) GEWISSHEIT.